Model of MAIT cell response to stimulation in the presence of TCR stimulation alone or together with inflammatory signals. Image provided by Ms. Chloe Slichter. Part of the ever growing family of T cells, mucosal-associated invariant T (MAIT) cells express an invariant T cell receptor (TCR) that recognizes bacterially derived metabolites in the context of MHC class I-related protein 1 (MR1). 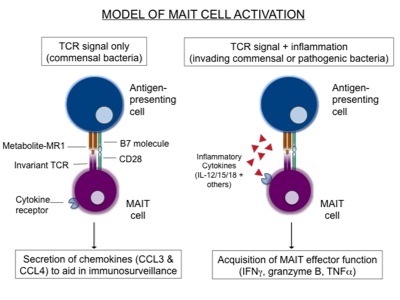 "MAIT cells are a unique interface between the immune system and commensal bacteria. Interestingly, the antigen that MAIT cells recognize is produced by both commensal and pathogenic bacteria, which led us to ask how MAIT cells are able to distinguish between pathogenic and commensal bacteria at mucosal sites" explains Chloe Slichter, PhD candidate in the Prlic Lab (Vaccine and Infectious Disease Division at Fred Hutch) and first author of a paper published in the Journal of Clinical Investigations Insight. Understanding how MAIT cells are regulated at mucosal sites is of utmost importance in the field of infectious diseases because they may act as one of the first responders to infections at the mucosal interface. In order to clarify how MAIT cells are activated, the study began by isolating MAIT cells from the blood of healthy human donors and stimulating them under various conditions. The researchers found that in contrast to conventional memory CD8+ T cells, MAIT cells produced a more robust and sustained IFN-γ, but not TNF-α response, upon a 12 hour and 24 hour incubation with the pro-inflammatory cytokines IL-12, IL-15 and IL-18 as compared to a TCR stimulation with anti-CD3/CD28. In contrast, conventional memory CD8+ T cells responded minimally to pro-inflammatory cytokine stimulation, and instead displayed a sustained response to TCR stimulation by secreting TNF-α starting as early as 6 hours. Next, the group asked what effect a combination of both a TCR plus inflammatory cytokine signal had on MAIT cell activation. Given their capacity to recirculate from mucosal tissues to the blood, monocytes stimulated through TLR4 or TLR8 were used in a co-culture assay with MAIT cells isolated from the same donor. Upon activation, the researchers showed that monocytes could indeed activate MAIT cells in a contact-independent way, likely through IL-12 secretion. Furthermore, they demonstrated that when inflammatory cytokines from the monocytes plus a TCR signal were delivered to MAIT cells, these signals synergized to induce robust MAIT cell activation, including the secretion of IFN-γ and granzyme B. As MAIT cells are clearly distinct from other T cells in terms their activation requirements, the group went on to characterize gene expression patterns of MAIT cells isolated from the blood and the mucosa at the single cell level. Importantly, the researchers found that not only was the MAIT cell expression profile different from that of NK cells and conventional memory T cells, but that mucosal MAIT cells expressed higher levels of genes associated with pro-inflammatory functions more so than MAIT cells in the blood. This feature lead the group to the conclusion that MAIT cells in the mucosa are poised effectors located at the site of pathogen entry. In summary, Ms. Slichter notes that "we have discovered how MAIT cells are able to reside in mucosal tissues without mounting an immune response to commensal bacteria, while still maintaining effective responses against pathogenic infections". In the absence of a pathogen, MAIT cells located at the site of infection are ready to react, but kept in check by the lack of specific signals. Together, these characteristics make them the perfect tool for preventive vaccines and highlight the importance of better understanding their function during infection. MAIT cells are warriors ready to fight but kept under strict control that prevents them from reacting to friends (commensal bacteria), but allows for a fast and efficient response to foes (pathogens). The study was supported by National Institutes of Health. Slichter CK, McDavid A, Miller HW, Finak G, Seymour BJ, McNevin JP, Diaz G,Czartoski JL, McElrath MJ, Gottardo R, Prlic M. 2016. Distinct activation thresholds of human conventional and innate-like memory T cells. JCI Insight, 1(8).